Happy New Year everyone!!! Can you believe it's 2013 already??? OMG! I hope you all had a fabulous Xmas and NYE =) The last few weeks have been absolutely mad hence the lack of posts but I've finally got a new post for you today. I recently hauled some indie items which included a few products from Vivid Lacquer. I was excited to get my hands on the stamping plate VL 001 which has a full skull image (so I can do manis for my skull loving friends Anita and Ange!) and other cute designs too. This mani doubled as my NYE mani as I didn't get time to do my nails doh! Thumb: I used 2 coats of OPI Glitzerland and Konad Special polish in black to stamp. Index: I used 2 coats of Ulta 3 Black Satin and Konad Special polish in white to stamp. Middle finger: I used 2 coats of OPI Alpine Snow and added 2mm square gold studs down the centre. Ring finger: I used 2 coats of Ulta 3 Black Satin and I used China Glaze Passion to stamp. Pinky: I used 2 coats of China Glaze Midnight Kiss as my base and added 1.5mm black round studs for a studded framed nail. This design has my name written all over it! So funky, I love it! YAY for new camera, your photos look really good! Absolutely loving it! And the pics look fab I think ^_^ Happy New Year my lovely!!! This is so insanely cute! I love the addition of the studs and your pictures are looking great already! I love this!! Edgy, yet fun! Happy New Year! 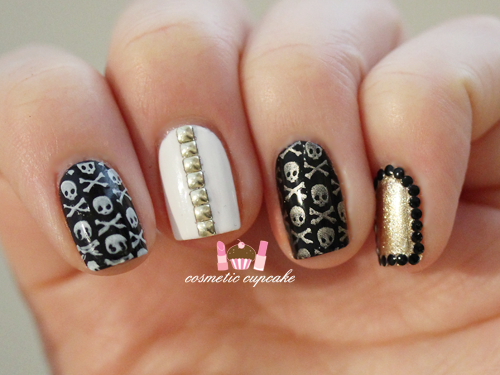 I don't like skulls but I love this mani! :) I think these were a good NYE mani? Did your friends notice them or comment on them? This is so gorgeous! Where did you get your studs? Wow!!! This mani rocks!!! I so love the color combos and the designs. I really love what you did here. Great job! these are lovely, feminine yet edgy..very nice.